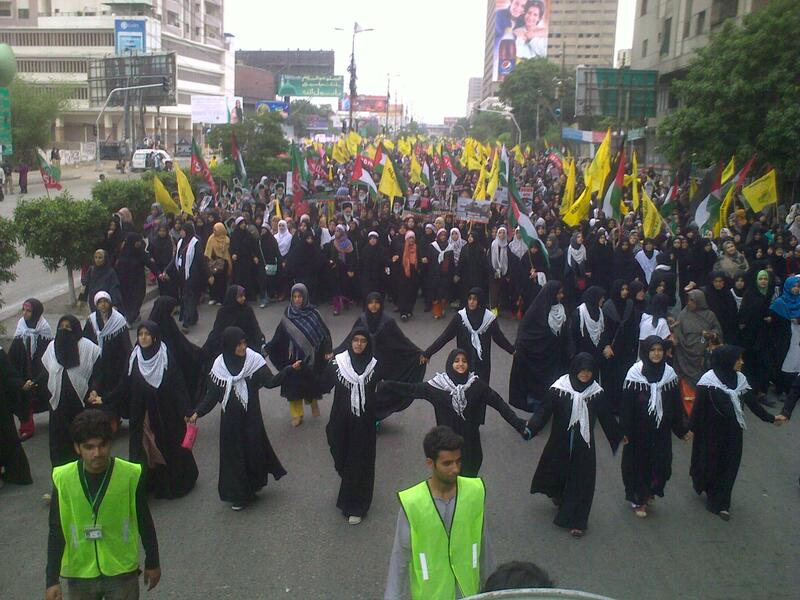 JNN 27 July 2014 Karachi : Muslims across the world Commemorated and came on the streets to protest against the atrocities and crimes committed by Israel against the defenseless and innocent people of Gaza. International Quds Day is an annual event held on the last Friday of Ramadhan that was founded in the late seventies to express solidarity with the oppressed Palestinian people and to oppose Israel’s control of Jerusalem-al-Quds. This year’s Quds Day rallies coincide with Israel’s military assault on Gaza, which has so far killed more than 700 people, nearly a fifth of them children, and injured over 5000 others. Israel has been pounding Gaza for the past 17 consecutive days since July 8, after having maintained a siege on this coastal strip since 2007. Quds Day demonstrations Was held in around 80 countries, including Iraq, Gaza Strip, Syria, India, Lebanon, the United Kingdom, Germany, Canada, Sweden, France, the United States, and in many predominantly Muslim countries in East Asia including Pakistan to condemn Israel’s atrocities against Palestine, to demand lifting of its eight-year blockade on Gaza in all its forms and underscoring the importance of the holy Quds to Muslims. Similar Al Quds Protest Rallies were Organised across Pakistan , by Different Organisations , while the Biggest of all these was Organised By Imamia Students Organisation ( ISO ) in Karachi , the Economic Hub of Pakistan , which was attended by thousands of Men , Women , Boys and Girls from all the walks of life , and from all the sections of the Society , regardless of of their cast , creed or ethnicity . The rally started from Numaish and headed towards its destination at Tibet Center. It was well organized and Well coordinated by the Volunteers of Imamia Scouts . Beside the Large No. of Participants , the rally was also attended by several well known Religious and Political Personalities , which included Senator Taj Haider (PPP ) , Mairaj Ul Huda ( Jamaat e Islami ) , Allama Abbas Kumaili ( JAP ) , Amin Shaheedi ( MWM ) and several others. At the End of the Rally , Khalid Meeshal the Leader of the Hamas Movement , also addressed the Rally Participants Live from Palestine through a Video Link and in his speech he deeply condemned the Illegal state of Israel and its Injust aggression , in which more than 1000 Palestinian Men , Women and Children has already Been Killed by Israeli Air Strikes and Parallel Ground Operations. Each year on Quds Day Muslims worldwide unite in solidarity against Israel and in support of the Palestinians because Islamic scholars have declared the liberation of Jerusalem-al-Quds a religious duty of all Muslims. They invite Muslims all over the world to consecrate the last Friday of the holy month of Ramadhan as Al-Quds Day and to proclaim the international solidarity of Muslims in support of the legitimate rights of the people of Palestine. During the First Intifada in January 1988, the Jerusalem Committee of the Organisation of the Islamic Cooperation (OIC) decided that Quds Day should be commemorated in public events throughout the Arab world. The Quds Day is against injustice and oppression in all its forms against all communities and people. Experts at Quds Day rally say more than $ 1,200 billion are annually spent in the world to build weapons, and the use of these weapons is mostly for crime, occupation, killing and bullying. Quds Day says people around the world have the right to enjoy justice, respect and freedom with no discrimination. For the past eight years due to Israel’s siege of Gaza, the majority of Palestinians haven’t travelled between the West Bank and Gaza. Palestinians are forced to stay in Gaza, which is a big prison now. The siege on Gaza was enforced by Israel in 2007 when virtually all exports were banned and imports severely limited. A joint report by Medical Aid for Palestinians and Save the Children notes that anemia affects over 36.8 per cent of pregnant women in Gaza and that anemia can result in “poor pregnancy outcome, reduced work productivity in adults,” and “contributes to 20 per cent of all maternal deaths” (“Gaza’s children: falling behind,” June 2012). Medical Aid for Palestinians has calculated that 10 per cent of children under five years old suffer chronic malnutrition, while anemia is rampant among pregnant women. Experts say they have renewed calls for the boycott of Israeli goods. With signs reading “Boycott Israeli agricultural products” and “support Palestinian farmers,” people protesting Israeli oppression of Palestinian farmers join together today to implore international supporters to join the boycott of Israeli agricultural produce. They believe that the boycott is his only hope for justice for Palestinian farmers being targeted by the Israeli army and oppressed by Israel. “We hope that it will put pressure on Israel to stop targeting us and allow us to farm our land as we used to,” say Palestinians. The boycott action follows a growing number of initiatives emerging in recent years from the Gaza Strip. On Quds Day, Palestinians and world Muslims call for implementation of UN Security Council resolution 242, which calls for withdrawal of occupation forces from the Gaza Strip, the West Bank and East Jerusalem. In view of these merciless and inhuman atrocities, protests are already taking place almost every day in most major cities of the world. These protests will reach their climax on the International Quds Day today. Oman’s Majlis Ash’Shura often affirms its support for the Palestinian cause and the importance of establishing Palestinian State with Al Quds as its capital. It says there is no doubt that the Palestinian people, who are subject to great Israeli oppression, will be victorious finally. Majlis Ash’shura along with Arab Parliamentary Union called upon the international community, parliamentary councils and human rights organisation to take practical steps to deter Israel and stop its recurrent aggression on Palestinian. The Majlis Ash’shura also called on the international community to resist Israeli attempts to Judaize the Palestinian city of Jerusalem-Al Quds, and evacuation of its Arab Muslim and Christian residents. This entry was posted in Jafria, Middle East and tagged al quds day, israel, Israeli, Palestinians, Youm ul Quds. Bookmark the permalink.